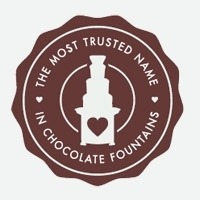 The Sephra Chocolate Rewards Club has been established to reward our loyal customers who not only support us through the purchase of our Sephra chocolate fountains but through the purchase of our premier Sephra brand chocolate fountain chocolates. It is designed to provide you with great discount pricing on the products and services you need and to help you keep your chocolate fountain investment in excellent condition. 10% discount on the purchase of commercial chocolate fountain accessories (i.e. : sanitation/wind guards, drip guards, fountain surrounds, etc.). 20% discount on the price of printing business cards and postcards for marketing your chocolate fountain services. 5% discount on future commercial chocolate fountain purchases. Available after the purchase of 12 cases. Approximate value: $50 - $150 per chocolate fountain purchased. 50% discount on labor costs when your chocolate fountain is serviced at the Sephra facility in San Diego, California. Approximate value: $100. Priority three (3) day repair/maintenance service at the Sephra facility in San Diego, California. Your fountain will be serviced within three (3) days of receipt. Join by calling us today at 858-675-3088. Purchase 2 cases of Sephra brand chocolate per month (24 cases per year). Six month minimum participation required (or purchase 12 cases of chocolate within a six month period) before the customer is eligible to receive a free Drive Shaft Replacement Kit. So long as you, the customer, maintain a running balance of chocolate purchased equal to an average of at least 2 cases per month you are eligible to receive the benefits of membership listed above. If the two case per month requirement is not met then Sephra reserves the right to terminate your membership. We thank you for your continued use of our Sephra brand products and welcome you as a member of the Sephra Chocolate Rewards Club. I used to buy chocolate from another company because I thought that I was saving money. One day I realized that there must be some maintenance required to keep my commercial chocolate fountain in top operating condition. The last thing I wanted was to have it go down during or before an event, so I called Sephra and was told of the recommended maintenance schedule of every 500 hours and how I could save money on the service by joining the Sephra Chocolate Rewards Club. I joined immediately since it was free and didn’t have any commitments tied to it other than buying 2 cases of chocolate on average per month which I was going through anyway. As it turns out, I now save money on all my chocolate orders and I have the peace of mind knowing that I am attending to the service my chocolate fountain requires. I also have saved a couple hundred dollars on other purchases as well. Not only am I pleased with the Chocolate Rewards Program, but I save a lot more money than I ever would have. I’ve made the switch! We have been currently using the Sephra Chocolate Rewards Club for approximately 3 months. Before we joined the program we were buying another chocolate because it seemed to be more convenient. Little did I realize before how inconvenient it is to not have your fountain functioning when it needs to be for an event because I hadn’t maintained it properly. Joining the Club has helped me to keep up the servicing of my equipment and also saved me a lot of money on my chocolate purchases. I roughly figure that I may reduce my chocolate costs by 15 to 30% by using the discounts and benefits associated with the program. I am extremely pleased with the Sephra’s Chocolate Rewards program. It couldn't be simpler. It only took me about a few seconds to opt in by entering in my email address. I started receiving the chocolate discounts immediately and have now also received some free parts to take care of the servicing that needed to be done that I would have otherwise had to pay for. I have also ordered some accessories to go along with my commercial chocolate fountain that have made the presentation much nicer including being able to use it now at outdoor events. Thanks for sponsoring this great customer loyalty program. It has really been a money saver for our business. CHOCOLATE REWARDS... WOW! INSTANT GRATIFICATION... Being new to the program it was great to see some freebies, a lot of discounts and a company addressing our financial needs. After two months I had saved over $200 that I would have never seen otherwise! Since I have been in the catering industry for over 15 years I have learned to be skeptical about rewards programs, but this has no strings attached. Sephra is a stand up company that seeks to respond to their customers needs and this is what I needed. Thank you Chocolate Rewards Club for helping to add to my bottom line and make me a priority when it counts.